03/28/2016 – Update Unity 5 Beta 4 Overall Improvements – Opt in now! This update is only for the Beta branch. We’re asking everyone to please opt in to the beta to try it out and test everything as much as possible. The next major patch v7.0 will make the switch from Unity 4 to 5, so we need everyone to play on the beta branch and let us know of any issues. We will no longer be making any changes to the Unity 4 build. Everyone can play together in multiplayer regardless of which build you use. 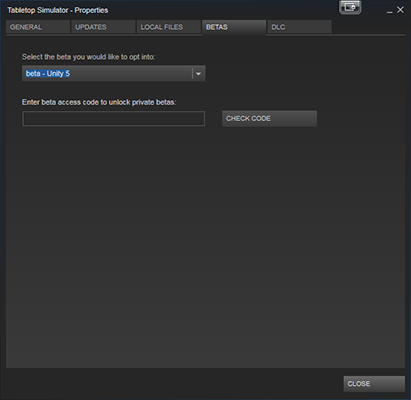 To opt in to the beta, right click on Tabletop Simulator in your Steam library, then click Properties. There will be a new “Betas” tab. At the drop down menu choose “beta – Unity 5”. If it asks for a code, you can ignore it, as you will get the download. You can post any issues and bugs you find here or here. Be sure to read the Known Issues in the original thread before posting. Objects will no longer go through each other. Optimized many scripts for improved performance. Loading objects is much faster. No more hard locks when cleaning up tons of objects. Joints are much more solid and don’t jitter like before. Greatly improved the accuracy of auto raise. Zones (Hidden, Lua, etc.) are now much more reliable. Increased the number of objects that can be selected / grabbed from 64 to 128. Concave/Nonconvex colliders are only supported for locked objects. Touch input is currently disabled for porting to Unity 5. Tablet screen is not working. All sounds aren’t working on Linux. LINUX USERS: Add -force-opengl to the launch parameters otherwise the game will crash. This is a Unity bug in Unity 5 that Unity is planning on fixing at some point. Minimum requirements Windows XP SP2. Minimum requirements Mac OS X 10.8. Fixed Counter setValue() not synchronizing across network. Fixed LuaButtons being tied to the Digital Permissions setting. Copy paste in Lua editor is now working. 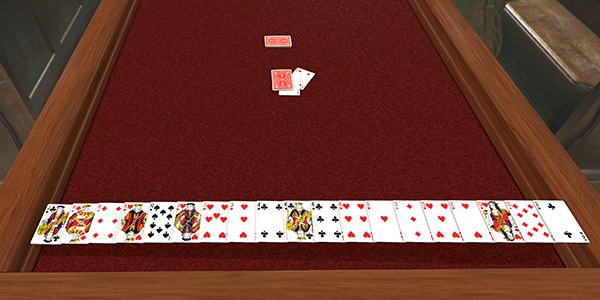 Cards in hand will now use the entire width of the hand allowing massive hands. Improved the layering effects to be less linear. Compound collider support using multiple meshes for custom models. Zone box near pointer shows for all zones instead of just hidden ones. Increased the max amount of vector paint lines that can be drawn. Optimizations on stutter causing issues. Fixed scroll wheel zooming camera in and out on notebook and lua notebook. Fixed issue with Lan not working. Fixed issue with Voice Chat being really quiet. Fixed cloning infinite bag bug creating garbage in save file. Fixed jittering cards in hand and other issues. Fixed tablet not working on Mac and maybe on Linux. Fixed “Remove Blindfold” button being stuck when activating F11. Fixed issue with 3D Text Tool hovering not working. Fixed threading mod loading on Linux. Fixed voice chat volume being way too low. Fixed non-convex objects falling through the table. Fixed end turn button making button sound twice. Fixed issue when hovering over trash can in the Workshop, Save/Load menus. Fixed issue with not being able to delete newly created snap points. Fixed issue with Digital Clock being used when digital is checked off in permissions. Fixed issue where players can type numbers in the counter when digital permission is checked off. Fixed transparency issues on miscellaneous UI elements.